Click here to read more from and about Thomas Merton and order his books online using Amazon.com. “There is in us an instinct for newness, for renewal, for a liberation of creative power. We seek to awaken in ourselves a force which really changes our lives from within. And yet the same instinct tells us that this change is a recovery of that which is deepest, most original, most personal in ourselves. To be born again is not to become somebody else, but to become ourselves.” - from “Christian Humanism” in Love and Living. "Life consists in learning to live on one’s own, spontaneous, freewheeling: to do this one must recognize what is one’s ownbe familiar and at home with oneself. This means basically learning who one is, and learning what one has to offer to the contemporary world, and then learning how to make that offering valid." "The purpose of education is to show us how to define ourselves authentically and spontaneously in relation to our worldnot to impose a prefabricated definition of the world, still less an arbitrary definition of ourselves as individuals. The world is made up of the people who are fully alive in it: that is, of the people who can be themselves in it and can enter into a living and fruitful relationship with each other in it. The world is, therefore, more real in proportion as the people in it are able to be more fully and more humanly alive: that is to say, better able to make a lucid and conscious use of their freedom. Basically, this freedom must consist first of all in the capacity to choose their own lives, to find themselves on the deepest possible level. A superficial freedom to wander aimlessly here and there, to taste this or that, to make a choice of distractions … is simply a sham. It claims to be a freedom of “choice” when it has evaded the basic task of discovering who it is that chooses. It is not free because it is unwilling to face the risk of self-discovery." - from “Learning to Live” in Love and Living. “People who know nothing of God and whose lives are centered on themselves, imagine that they can only find themselves by asserting their own desires and ambitions and appetites in a struggle with the rest of the world. They try to become real by imposing themselves on other people, by appropriating for themselves some share of the limited supply of created goods and thus emphasizing the difference between themselves and the other men who have less than they, or nothing at all. “It seems to me that policies which are content to create an ‘image’ of a benevolent and peace-loving America are valueless, because they lack the depth and the seriousness of motivation which are absolutely necessary for constructive action in a world crisis. Confronted with the difficult task of ‘assuming world leadership’ in a world from which it has remained traditionally and by preference isolated, America seems to have reacted with adolescent panic and truculence. Hostility, unpopularity and totally unsympathetic criticism have proved to be a serious test of the American political ideology. “There is a silent self within us whose presence is disturbing precisely because it is so silent: it can’t be spoken. It has to remain silent. To articulate it, to verbalize it, is to tamper with it, and in some ways to destroy it. "I have learned that an age in which politicians talk about peace is an age in which everybody expects war: the great men of the earth would not talk of peace so much if they did not secretly believe it possible, with one more war, to annihilate their enemies forever. Always, "after just one more war" it will dawn, the new era of love: but first everybody who is hated must be eliminated. For hate, you see, is the mother of their kind of love. “What we are asked to do is to love; and this love itself will render both ourselves and our neighbor worthy if anything can. “There must be a time of day when the man who makes plans forgets his plans, and acts as if he had no plans at all. There must be a time of day when the man who has to speak falls very silent. And his mind forms no more propositions, and he asks himself: Did they have a meaning? “We have to recognize that a spirit of individualism and confusion has reduced us to an ethic of ‘every man for himself and the devil take the hindmost.’ This ethic, unfortunately sometimes consecrated by Christian formulas, is nothing but the secular ethic of the affluent society, based on the false assumption that if everyone is bent on making money for himself the common good will automatically follow, due to the operation of economic laws. "The moral evil in the world is due to man’s alienation from the deepest truth, from the springs of spiritual life within himself, to his alienation from God. Those who realize this try desperately to persuade and enlighten their brothers. But we are in a radically different position from the first Christians, who revolutionized an essentially religious world of paganism with the message of a new religion that had never been heard of. We on the contrary live in an irreligious post-Christian world in which the Christian message has been repeated over and over until it has come to seem empty of all intelligible content to those whose ears close to the word of God even before it is uttered. In their minds Christian is no longer identified with newness and change, but only with the static preservation of outworn structures." - from "Peace in the Post-Christian Era"
"In a spiritual crisis of the individual, the truth and authenticity of the person’s spiritual identity are called into question. He is placed in confrontation with reality and judged by his ability to bring himself into a valid and living relationship with the demands of his new situation. In the spiritual, social, historic crises of civilizations  and of religious institutions  the same principle applies. Growth, survival and even salvation may depend on the ability to sacrifice what is fictitious and unauthentic in the construction of one’s moral, religious or national identity. One must then enter upon a different creative task of reconstruction and renewal. This task can be carried out only in the climate of faith, of hope and of love: these three must be present in some form, even if they amount only to a natural belief in the validity and significance of human choice, a decision to invest human life with some shadow of meaning, a willingness to treat other men as other selves." - from "Faith and Violence"
"…community is not built by man, it is built by God. It is God’s work and the basis of community is not just sociability but faith. This is what we need to see very clearly, because it is very important." "… what really starts fighting is possessions. And people get into fights by preferring things to people. This is well developed in Christian theology, and therefore, for us, the importance of detachment from things, the importance of poverty, is that we are supposed to be free from things we might prefer to people. You can extend that to any limits you like  wherever things become more important than people we are in trouble. That is the crux of the whole matter. Figure it out for yourself!" - from "Thomas Merton in Alaska"
"The deep secrecy of my own being is often hidden from me by my own estimate of what I am. My idea of what I am is falsified by my admiration for what I do. And my illusions about myself are bred by contagion from the illusions of other men. We all seek to imitate one another’s imagined greatness. If I do not know who I am, it is because I think I am the sort of person everyone around me wants to be. Perhaps I have never asked myself whether I really wanted to become what everybody else seems to want to become. Perhaps if I only realized that I do not admire what everyone seems to admire, I would really begin to live after all. I would be liberated from the painful duty of saying what I really do not think and of acting in a way that betrays God’s truth and the integrity of my own soul." - from "No Man is an Island"
"Love is the revelation of our deepest personal meaning, value, and identity. But this revelation remains impossible as long as we are the prisoner of our own egoism. I cannot find myself in myself, but only in another. My true meaning and worth are shown to me not in my estimate of myself, but in the eyes of the one who loves me; and that one must love me as I am, with my faults and limitations, revealing to me the truth that these faults and limitations cannot destroy my worth in their eyes; and that I am therefore valuable as a person, in spite of my shortcomings, in spite of the imperfections of my exterior ‘package.’ The package is totally unimportant. What matters is this infinitely precious message which I can discover only in my love for another person. And this message, this secret, is not fully revealed to me unless at the same time I am able to see and understand the mysterious and unique worth of the one I love." - from "Love and Living"
"People seem to think that it is in some way a proof that no merciful God exists, if we have so many wars. On the contrary consider how in spite of centuries of sin and greed and lust and cruelty and hatred and avarice and oppression and injustice, spawned and bred by the free wills of men, the human race can still recover, each time, and can still produce men and women who overcome evil with good, hatred with love, greed with charity, lust and cruelty with sanctity. How could all this be possible without the merciful love of God, pouring out His grace upon us? Can there be any doubt where wars come from and where peace comes from, when the children of this world, excluding God from their peace conferences, only manage to bring about greater and greater wars the more they talk about peace?" - from "Seeds"
"Living with other people and learning to lose ourselves in the understanding of their weakness and deficiencies can help us to become true contemplatives. For there is no better means of getting rid of the rigidity and harshness and coarseness of our ingrained egoism, which is the one insuperable obstacle to the infused light and action of the Spirit of God. Even the courageous acceptance of interior trials in utter solitude cannot altogether compensate for the work of purification accomplished in us by patience and humility in loving other men and sympathizing with their most unreasonable needs and demands." - from "Seeds"
"The dread of being open to the ideas of others generally comes from our hidden insecurity about our own convictions. We fear that we may be "converted"  or perverted  by a pernicious doctrine. On the other hand, if we are mature and objective in our open-mindedness, we may find that viewing things from a basically different perspective  that of our adversary  we discover our own truth in a new light and are able to understand our own ideal more realistically. Our willingness to take an alternative approach to a problem will perhaps relax the obsessive fixation of the adversary on his view, which he believes is the only reasonable possibility and which he is determined to impose on everyone else by coercion…This mission of Christian humility in social life is not merely to edify, but to keep minds open to many alternatives. The rigidity of a certain type of Christian thought has seriously impaired this capacity, which nonviolence must recover. " - from "Passion For Peace"
"The life of contemplation in action and purity of heart is, then, a life of great simplicity and inner liberty. One is not seeking anything special or demanding any particular satisfaction. One is content with what is. One does what is to be done, and the more concrete it is, the better. One is not worried about the results of what is done. One is content to have good motives and not too anxious about making mistakes. In this way one can swim with the living stream of life and remain at every moment in contact with God, in the hiddenness and ordinariness of the present moment with its obvious task." - from "The Inner Experience"
"Where there is a deep, simple, all-embracing love of man, of the created world of living and inanimate things, then there will be respect for life, for freedom, for truth, for justice and there will be humble love of God. But where there is no love of man, no love of life, then make all the laws you want, all the edicts and treaties, issue all the anathemas; set up all the safeguards and inspections, fill the air with spying satellites, and hang cameras on the moon. As long as you see your fellow man being essentially to be feared, mistrusted, hated, and destroyed, there cannot be peace on earth. And who knows if fear alone will suffice to prevent a war of total destruction?" - from "Seeds of Destruction"
"Inexorably life moves on toward crisis and mystery. One must not be too quickly preoccupied with professing definitively what is true and what is false. Not that true and false do not matter. But if at every instant one wants to grasp the whole and perfect truth of a situation, particularly a concrete and limited situation in history or in politics, one only deceives and blinds himself. Such judgments are only rarely and fleetingly possible, and sometimes, when we think we see what is most significant, it has very little meaning at all. So it is possible that the moment of my death may turn out to be, from a human and ‘economic’ point of view, the most meaningless of all. Meanwhile, I do not have to stop the flow of events in order to understand them. On the contrary, I must move with them or else what I think I understand will be no more than an image in my own mind." - from "A Year with Thomas Merton"
"Fickleness and indecision are signs of self-love. As soon as you taste one way of prayer, you want to try another. You are always making resolutions and breaking them by counter-resolutions. You ask your confessor and do not remember the answers. Before you finish one book you begin another, and with every book you read you change the whole plan of your interior life. This is what it means to renounce not only pleasures and possessions, but even your own self." - from "New Seeds of Contemplation"
"There is another self, a true self, who comes to full maturity in emptiness and solitude  and who can of course, begin to appear and grow in the valid, sacrificial and creative self-dedication that belong to a genuine social existence. But note that even this social maturing of love implies at the same time the growth of a certain inner solitude. Without solitude of some sort there is and can be no maturity. Unless one becomes empty and alone, he cannot give himself in love because he does not possess the deep self which is the only gift worthy of love. And this deep self, we immediately add, cannot be possessed. My deep self in not ‘something’ which I acquire, or to which I ‘attain’ after a long struggle. It is not mine, and cannot become mine. It is no ‘thing’  no object. It is ‘I’. " - from "Disputed Questions"
"You are fed up with words, and I don't blame you. I am nauseated by them sometimes. I am also, to tell the truth, nauseated by ideals and with causes. This sounds like heresy, but I think you will understand what I mean. The big results are not in your hands or mine, but they suddenly happen, and we can share in them; but there is no point in building our lives on this personal satisfaction, which may be denied us and which after all is not that important." "In our age everything has to be a ‘problem.’ Ours is a time of anxiety because we have willed it to be so. Our anxiety is not imposed on us by force from outside. We impose it on our world and upon one another from within ourselves. Sanctity in such an age means, no doubt, traveling from the area of anxiety to the area in which there is no anxiety or perhaps it may mean learning, from God, to be without anxiety in the midst of anxiety. Contradictions have always existed in the soul of man. But it is only when we prefer analysis to silence that they become a constant and insoluble problem. We are not meant to resolve all contradictions but to live with them and rise above them and see them in the light of exterior and objective values which make them trivial by comparison." - from "Thoughts in Solitude"
If what most people take for granted were really trueif all you needed to be happy was to grab everything and see everything and investigate every experience and then talk about it, I should have been a very happy person, a spiritual millionaire, from the cradle even until now…What a strange thing! In filling myself, I had emptied myself. In grasping things, I had lost everything. In devouring pleasures and joys, I had found distress and anguish and fear. "The fact that our being necessarily demands to be expressed in action should not lead us to believe that as soon as we stop acting we cease to exist. We do not live merely in order to ‘do something’  no matter what. Activity is just one of the normal expressions of life, and the life it expresses is all the more perfect when it sustains itself with an ordered economy of action. This order demands a wise alternation of activity and rest. We do not live more fully merely by doing more, seeing more, tasting more, and experiencing more than we ever have before. On the contrary, some of us need to discover that we will not begin to live more fully until we have the courage to do and see and taste and experience much less than usual." "Perhaps peace is not, after all, something you work for, or ‘fight for.’ It is indeed ‘fighting for peace’ that starts all the wars. What, after all, are the pretexts of all these Cold War crises, but ‘fighting for peace?’ Peace is something you have or do not have. If you are yourself at peace, then there is at least some peace in the world. Then share your peace with everyone, and everyone will be at peace." - from "Conjectures of a Guilty Bystander"
"Even though we have the power to destroy the whole world, life is stronger than the death instinct and love is stronger than hate. It does not make logical sense to be too hopeful, but once again this is not a question of logic and one does not look for signs of hope in the newspapers or the pronouncements of world leaders (in these there is seldom anything really hopeful, and that which is supposed to be most encouraging is usually so transparently hopeless that it moves one closer to despair). Because there is love in the world, and because Christ has taken our nature to Himself, there remains always the hope that man will finally, after many mistakes and even disasters, learn to disarm and to make peace, recognizing that he must live at peace with his brother. Yet never have we been less disposed to do this." - from "Conjectures of a Guilty Bystander"
The way to find the real ‘world’ is not merely to measure and observe what is outside us, but to discover our own inner ground. For that is where the world is, first of all: in my deepest self. But there I find the world to be quite different from the ‘obligatory answers.’ This ‘ground,’ this ‘world’ where I am mysteriously present at once to my own self and to the freedoms of all other men, is not a visible objective and determined structure with fixed laws and demands. It is a living and self-creating mystery of which I am myself a part, to which I am myself my own unique door. When I find the world in my own ground, it is impossible for me to be alienated by it." "A humble man can do great things with an uncommon perfection because he is no longer concerned about incidentals, like his own interests and his own reputation, and therefore he no longer needs to waste his efforts in defending them. For a humble man is not afraid of failure. In fact, he is not afraid of anything, even of himself, since perfect humility implies perfect confidence in the power of God before Whom no other power has any meaning and for Whom there is no such thing as an obstacle. Humility is the surest sign of strength." "We cannot avoid missing the point of almost everything we do. But what of it? Life is not a matter of getting something out of everything. Life itself is imperfect. All created beings begin to die as soon as they begin to live, and no one expects any one of them to become absolutely perfect, still less to stay that way. Each individual thing is only a sketch of the specific perfection planned for its kind. Why should we ask it to be anything more?" Now one of the things we must cast out first of all is fear. Fear narrows the little entrance of our heart. It shrinks up our capacity to love. It freezes up our power to give ourselves. If we were terrified of God as an inexorable judge, we would not confidently await His mercy, or approach Him trustfully in prayer. "Either you look at the universe as a very poor creation out of which no one can make anything or you look at your own life and your own part in the universe as infinitely rich, full of inexhaustible interest, opening out into infinite further possibilities for study and contemplation and interest and praise. Beyond all and in all is God." MY LORD GOD, I have no idea where I am going. I do not see the road ahead of me. I cannot know for certain where it will end. Nor do I really know myself, and the fact that I think that I am following your will does not mean that I am actually doing so. But I believe that the desire to please you does in fact please you. And I hope I have that desire in all that I am doing. I hope that I will never do anything apart from that desire. And I know that if I do this you will lead me by the right road though I may know nothing about it. Therefore will I trust you always though I may seem to be lost and in the shadow of death. I will not fear, for you are ever with me, and you will never leave me to face my perils alone. - from "Thoughts in Solitude"
Sunrise: hidden by pines and cedars to the east, I saw the red flame of the kingly sun glaring through the black trees, not like dawn but like a forest fire. Then the sun became distinguished as a person, and he shone silently and with solemn power through the branches, and the whole world was silent and calm. Sunrise: it is an event that calls forth solemn music in the very depths of man’s nature, as if one’s whole being had to attune itself to the cosmos and praise God for the new day, praise him in the name of all the creatures that ever were or will ever be. I look at the rising sun and feel that now upon me falls the responsibility of seeing what all my ancestors have seen…praising God before me. Whether or not they praised him then, for themselves, they must praise him now in me. When the sun rises each one of us is summoned by the living and the dead to praise God. - from "Thomas Merton Journal"
A monk is a man who has given up everything in order to possess everything. He is one who has abandoned desire in order to achieve the highest fulfillment of all desire. He has renounced his liberty in order to become free. He goes to war because he has found a kind of war that is peace. Beyond imagination, beyond grandeur, power, wisdom, and the light of the mind, the monk has found the key to existence in things without romance and without drama: labor, hunger, poverty, solitude, the common life. It is the silence of Christ's Nazareth, in which God is praised without pomp, among the wood shavings. - from "The Waters of Siloe"
Into this world, this demented inn, in which there is absolutely no room for him at all, Christ has come uninvited. But because he cannot be at home in it, because he is out of place in it, and yet he must be in it, his place is with those others who do not belong, who are rejected by power, because they are regarded as weak, those who are discredited, who are denied the status of persons, tortured, exterminated. With those for whom there is no room, Christ is present in this world. "My own personal task is not simply that of poet and writer (still less commentator, pseudo-prophet); it is basically to praise God out of an inner center of silence, gratitude, and ‘awareness.’ This can be realized in a life that apparently accomplishes nothing. Without centering on accomplishment or nonaccomplishment, my task is simply the breathing of this gratitude from day to day, in simplicity, and for the rest turning my hand to whatever comes, work being part of praise, whether splitting logs or writing poems, or best of all simple notes." "Our task now is to learn that if we can voyage to the ends of the earth and find ourselves in the aborigine who most differs from ourselves, we will have made a fruitful pilgrimage. That is why pilgrimage is necessary, in some shape or other. Mere sitting at home and meditating on the divine presence is not enough for our time. We have to come to the end of a long journey and see that the stranger we meet there is no other than ourselves  which is the same as saying we find Christ in him." "The importance of detachment from things, the importance of poverty, is that we are supposed to be free from things that we might prefer to people. Wherever things have become more important than people, we are in trouble. That is the crux of the whole matter." "If I insist on giving you my truth, and never stop to receive your truth in return, then there can be no truth between us. Christ is present 'where two or three are gathered in my name.' But to be gathered in the name of Christ is to be gathered in the name of the Word made flesh, of God made man. It is therefore to be gathered in the faith that God has become man and can be seen in man, that he can speak in man and that he can enlighten and inspire love in and through any man I meet. It is true that the visible Church alone has the official mission to sanctify and teach all nations, but no man knows that the stranger he meets coming out of the forest [or the desert of Iraq!!!] in a new country is not already an invisible member of Christ and perhaps one who has some providential or prophetic message to utter." ".....in an evolved society there are no innocent victims of propaganda. Propaganda succeeds because men want it to secceed. It works on minds because those minds want to be worked on. Its conclusions bring apparent light and satisfaction because that is the kind of satisfaction that people are longing for. It leads them to actions for which they are already half prepared: all they ask is that these actions be justified. If war propaganda succeeds it is because people want war, and only need a few good reasons to justify their own desire." "What is the place of the Christian in all this? Is he simply to fold his hands and resign himself to the worst, accepting it as the inescapable will of God and preparing himself to enter heaven with a sigh of relief? Should he open up the apocalypse and run out into the street to give everyone his idea of what is happening? Or worse still, should he take a hard-headed and "practical" attitude about it and join in the madness of the warmakers, calculating how by a "first strike", the glorious Christian West can eliminate atheistic communism for all time and usher in the millennium? ......I am no prophet and no seer but it seems to me that this last position may very well be the most diabolical of illusions, the great and not even subtle temptation of a Christianity that has grown rich and comfortable, and is satisfied with its riches. What are we to do? The duty of the Christian in this crisis is to strive with all his power and intelligence, with his faith, hope in Christ, and love for God and man, to do the one task which God has imposed upon us in the world today. That task is to work for total abolition of war." "The mission of Christian humility in social life is not merely to edify, but to keep minds open to many alternatives. The rigidity of a certain type of Christian thought has seriously impaired this capacity, which nonviolence must recover." 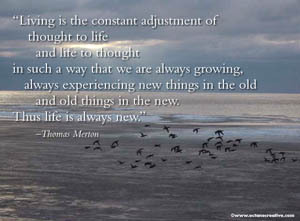 "Living is the constant adjustment of thought to life and life to thought in such a way that we are always growing, always experiencing new things in the old and old things in the new. Thus life is always new." By reading the scriptures I am so renewed that all nature seems renewed around me and with me. The sky seems to be a pure, a cooler blue, the trees a deeper green…. The whole world is charged with the glory of God and I feel fire and music … under my feet. "The things I thought were so important -- because of the effort I put into them -- have turned out to be of small value. And the things I never thought about, the things I was never able to either to measure or to expect, were the things that mattered." love and grace in our hearts." and we cannot be without Him."